I had the pleasure of participating in a conference on Innovation for Inclusive Development organised by the OECD, the World Bank and UNU-Merit. Discussions in the conference sought to find ways in which governments, private sector, the research community and other stakeholders can support the emergence of and scaling up of inclusive innovations. How does an enabling environment for inclusive innovations look like? We all agree that innovation is an important driver of (income) growth. Question is: is this growth inclusive? It’s been argued that innovation can be exclusionary by increasing income inequalities and reducing opportunities for different groups in society, i.e. creating ‘social exclusion’ (see my post on this here). Affected groups tend to be low income households and communities which, if the trajectory of development continues as is, may never be able to participate in the ‘mainstream’ economy. 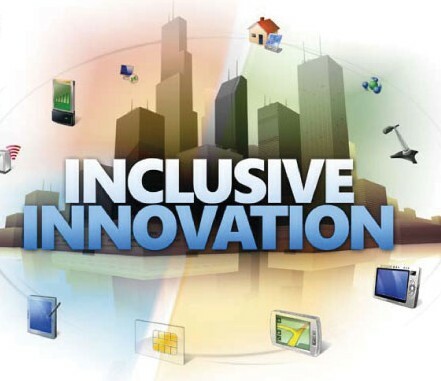 Inclusive innovation therefore explicitly aims at improving the welfare these low-income and excluded groups. Going by the proportions of people that fall into this category in developing countries, and globally (income inequality and social exclusion is rife in the developed world too), there’s need to mainstream this approach to development. What is inclusive innovation anyway? There’s lots of debate on this and related terms in academic circles lately. The OECD categories innovations for and by low- and middle-income groups as inclusive innovations, thereby including terms like frugal innovation and grassroots innovation under this umbrella concept. Social innovation which tend to be business-model innovation also fall under this umbrella. Informal-sector innovation qualifies too, though a lot of exploratory work is needed to understand this broad area from an innovation studies perspective. In a developing country, the domain in which inclusive innovation occurs or targets is immense going by the proportion of the formal:informal economies. Thus the need to mainstream this idea in theory and practice. One of the most effective ways of mainstreaming inclusive innovation is through policy. A case in point is India which currently hosts one of the most dynamic environments for grassroots innovations. Through policy, India has set up an ecosystem institutions like universities, government agencies, intellectual property law firms, and private sector firms that facilitate the development and scaling up of innovations by farmers, mechanics, artisans, etc. At the centre of this ecosystem is the National Innovation Foundation, a government body spawned from the famous Honey Bee Network. The NIF provides institutional support for scouting, spawning, sustaining and scaling up of grassroots innovations. Examples of such support include filing patents for novelties on behalf of innovators, market research and testing of promising inventions, and financing commercialisation through a Micro Venture Innovation Fund. NIF also runs a biennial national competition for grassroots innovations, an IGNITE award targeted at child inventors and various Festivals of Innovation. Beyond the NIF, it is clear from the rhetoric of India’s government, specifically the Ministry of Science and Technology, the Confederation of Indian Industry and even the Ministry of Skill Development, Entrepreneurship, Youth Affairs and Sports (and Sports? very interesting combination of mandates in this ministry 🙂 that inclusive innovation is a forefront policy agenda. There’s deliberate effort in government to promote a national culture that supports inclusive innovation, and to propel India to be the global inclusive innovation hub, through programmes such as Make in India, Clean India, and Inclusive India, and Innovation Clubs in schools. The success of this policy approach in India is indicative of the potential it offers for other developing countries. First of all, the notion of inclusion should pervade all discourse in policy processes. Secondly, policies that directly affect innovation activities in a country such as industrial policy, entrepreneurship policy, science and technology policy, etc, should explicitly provide for inclusive innovation. Currently, many African STI policies vaguely acknowledge the informal sector, let alone the innovative activities going on there. Kenya’s STI policy for instance adopts the National Systems of Innovation approach which by design, focuses heavily on R&D-based firm-level innovation, and therefore, doesn’t give due attention to innovation in the informal sector. Apart from a reference to protecting indigenous knowledge, the policy has no explicit rhetoric addressing any of the types of inclusive innovation discussed here. Beyond STI policies, current programmes focused on promoting entrepreneurship also fall short as they are primarily geared towards inclusion of women and youth as entrepreneurs, and not explicitly incentivising these businesses to produce products and services that foster social inclusion. We need to place innovation for inclusive growth on the policy agenda. Although we need more studies to help us understand how innovation policies affect inclusiveness, it would safe to say that such an agenda would at the very least stimulate dialogue on the topic, which is a good starting point. This entry was posted in Africa, Innovation, Kenya and tagged Africa, inclusive innovation, india, Kenya. Bookmark the permalink.